A few months after my 17th birthday, my mom and dad made me realize I was going to need some gas money -- and that the money wasn’t going to come from their pockets. Therefore, I needed to find a j-o-b. I don’t recall what made me stop into Vesuvio, but I’m guessing it’s because it was two minutes from my high school, and if I was going to make it to track practice and then to work, I would need to be pretty close. Anyway, I worked at Vesuvio for a year and a half, and then came back the summer after college. I loved working there; I loved that I worked with all my best friends, I loved that we closed at 10pm so I could still have a life, and I especially loved the food. Now, it’s seven years later, and I still frequent Vesuvio every time I go home. Recently, Vesuvio remodeled their place. They exchanged the solid-color drywall for beautiful exposed brick. They bordered the room with small colorful glass-like tiles that accent the brick, and they are also in the process of getting their menus redone. All-in-all, it’s great to see a small, family-run restaurant that has stood the test of time and that is thriving during these economic times. So what’s that say about their food? Well, I arrived, unsure if anyone was going to be joining me. 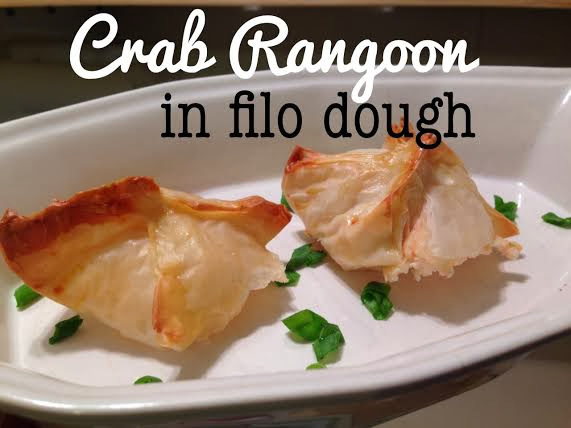 I was headed back to Maryland in an hour, and it had been too long since the last time I had been to the restaurant. The first person I saw was my waitress, Gracie. She greeted me with a hug and kiss, and sat down with me while I was deciding on what to eat. We talked about family, her recent marriage, and her little girl. As we were catching up, my dad and his friend Jimmy walked in, fresh off the job site. While Gracie was reciting the specials to them, I took a walk up front to the counter to see what kinds of pizzas they had on display. They had Broccoli and Tomato, Grandma’s Style with Basil and Tomatoes, Eggplant Parmigiana, and Cheesesteak Stuffed Pizza. 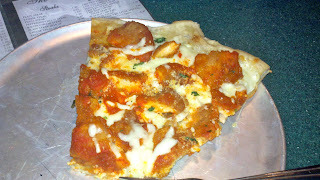 My favorite, however, was the Hot Wing Pizza. Large chunks of breaded chicken, bleu cheese dressing, mozzarella cheese, and Vesuvio’s delicious buffalo sauce. I knew I had to get it, regardless of anything else I was thinking about eating for lunch that day. A few minutes after my dad arrived, Mrs. Gussen, my former boss and owner of the establishment, came over with a “free sample” for us! 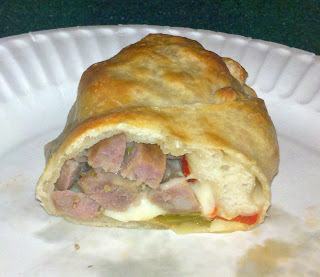 It was a mini calzone, stuffed with sweet Italian sausage, red and green bell peppers, and mozzarella cheese. Served with a side of marinara, a couple of these would make a perfect start to any lunch or dinner at Vesuvio. While we were all enjoying our sample, my slice of Hot Wing Pizza, and my sister, arrived at the table. I usually have to try to convince Andrea to get an appetizer. See, I like to eat a lot - and I can never decide what to get, so I always make her get something that I want, so we can “share”. In which, “share” means, let me eat 3/4 of it, but you order it, so I don’t look like a piggy. Anyway, Andrea and I both skipped the appetizers, especially because we were already brought one, and I did order the pizza already. My dad and Jimmy had both ordered mini Chicken Caesar Salads, and they were already enjoying them as Andrea and I placed our order. We’re both pretty hooked on Vesuvio’s buffalo sauce, so since I got the pizza, Andrea smelled the sauce on that and in a minute she knew she wanted a Buffalo Chicken Cheesesteak. I opted for a steak sandwich as well, but I got a Chicken Cheesesteak with Broccoli Rabe. I never get broccoli rabe in Maryland, so when I come home, it’s always a treat. Our steak sandwiches came out, and they looked as perfect as I remember them. The bread is always soft, the chicken is chopped nice and fine, which pairs well with the melted cheese. It’s almost like the take the chopped chicken and blend it together with the cheese in a big pot first, and then put it on the sandwich. I particularly hate when you can tell that they just slap the chicken on the bun and then put two slices of cheese on there, in hopes it melts by the time it gets to your table. Not theses sandwiches. When I picked up one half of the sandwich, a combination of juices from the olive oil from the sauteed broccoli rabe, the juicy chicken breast, and the melted cheese oozed out from the bottom of the bread, and I was just as happy to sop it up with extra pieces of the roll, to ensure I got every last drop of goodness. Vesuvio will always be somewhere that is a part of me. I have a million memories behind the scenes, and I keep going back for more, every time I am in New Jersey. The only complaint I ever have, is I wish the wait staff had uniforms!! Most of the servers wear flip flops and shorts, with no regard for safety in the kitchen. 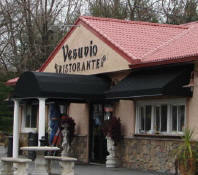 But, if that’s the worst thing about Vesuvio Ristorante, I think, if you haven’t been there yet, take the time out to go get yourself a good, homestyle, Italian meal!